Feel confident and inspired when you release the refreshing citrus accords in the Pasha de Cartier Edition Noire collection. Prepared by talented perfumers at Cartier, this fragrance is a powerful accessory for the modern, independent man. Released in 2013, this unique scent highlights your masculinity with deep, woody notes of cedar that mingle with intense traces of warm, resinous amber. Wear this aromatic fragrance to boost your mood and charm while you're spending the day with colleagues or friends. 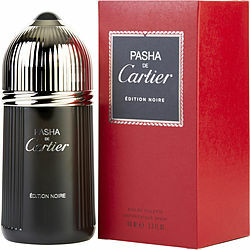 Pasha de Cartier Edition Noire,it's a very Good option for men. This one of my favorites! Has slight mild peppery, sweet, floral scent. This is a Great sent for a man with style.